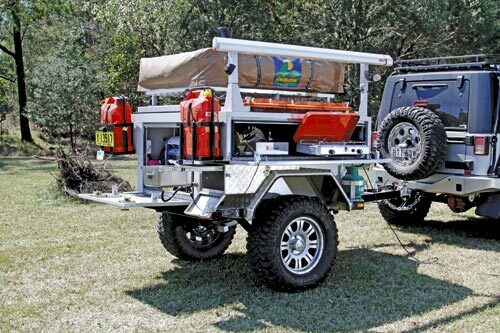 Many camper trailers claim to have offroad capabilities, but in my experience only a few meet the absolute offroad credentials of the Xtreme Flyfisher on review. The new Xtreme Flyfisher is impressive, having evolved from the brain of owner Leo Ruiu, a keen fly fisherman who wanted something more comfortable than his swag yet rugged enough to follow his Jeep Wrangler Rubicon offroad. When he couldn't find what he wanted he set about designing his own. 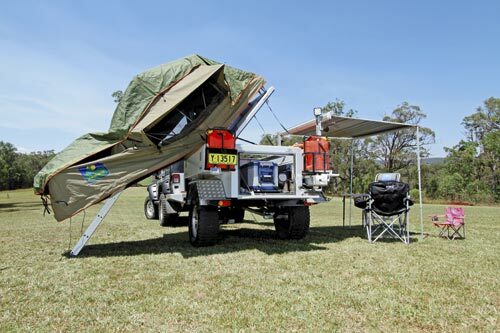 The result is an extremely tough, light and practical package for one or two people that will go anywhere, with a heap of ground clearance and ample departure angle. We tested the 'proof of concept' model, which Leo put together to demonstrate his idea. It had a couple of minor design quirks, although most have already been sorted for later production. 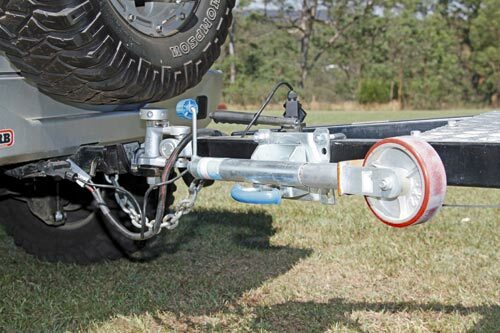 The trailer is designed around a tough chassis made from 75x50x3mm Duragal, except for the rear cross-member, which is 100x50x3mm because it supports a tough hitch receiver. 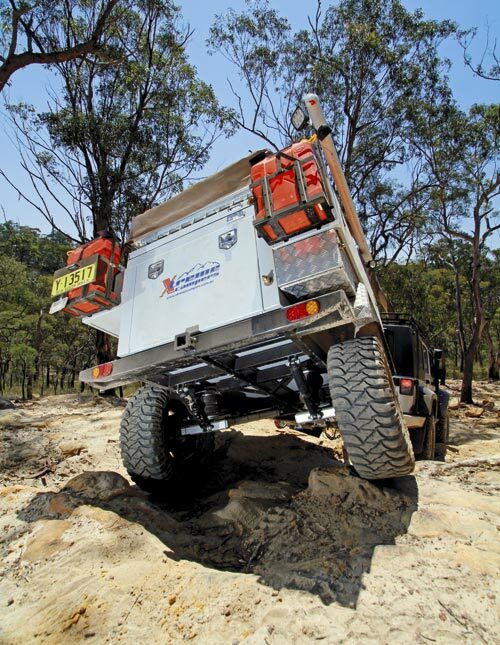 Leo reckons he's used it to haul a Toyota FJ45 4WD out of a difficult situation. 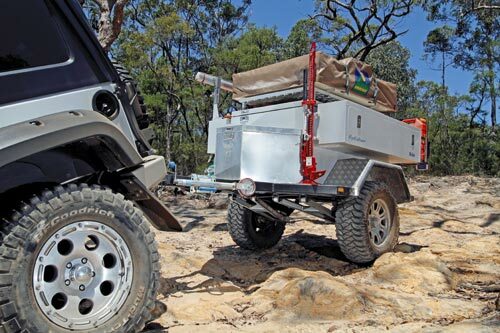 To compensate for the sturdy chassis is a lightweight aluminium body, which enables the trailer to have an all-up weight of just 530kg yet sustain an ATM of 1300kg, giving an impressive carrying capacity of 770kg. 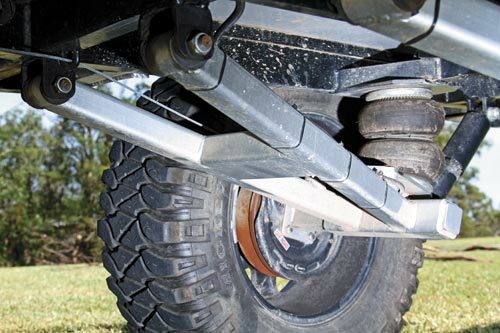 Given this potentially great variability in weight, Xtreme designed its own independent suspension set-up with Firestone airbags. 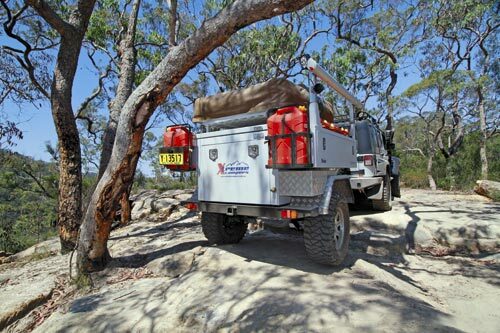 Some offroaders don't like to use airbags, but Leo says they're quality, high performance items and their flexibility in height, ride and carrying capacity can't be beaten. Leo will even throw in a spare airbag for good measure, if you're unsure. 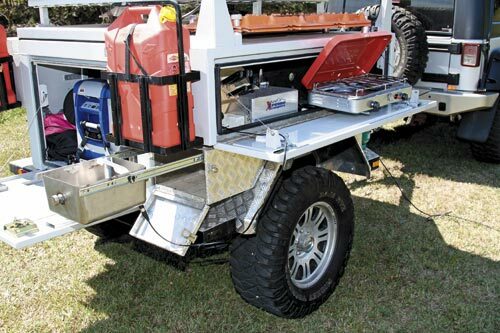 The trailer can be supplied in powder-coat to match virtually any colour you want. The trailer is drawn along by the McHitch Uniglide 3.5t coupling. 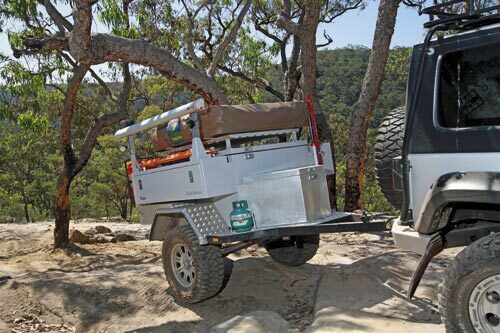 It proved to be a tough and flexible hitch, moving freely as the Flyfisher negotiated several large rocks through our wild Blue Mountains test trail, west of Sydney. The main box of the trailer is a spacious 1060x1480x790mm, though a chunk of that was taken up by the 37L ARB fridge (a 60L option is available) in the test unit. 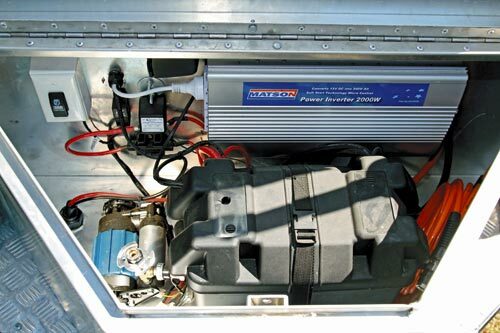 A later version has a much bigger front storage box to carry the fridge, freeing up the room inside for incidentals as well as the single 100Ah battery, 2000W modified sine wave inverter and the compressor for the suspension system. 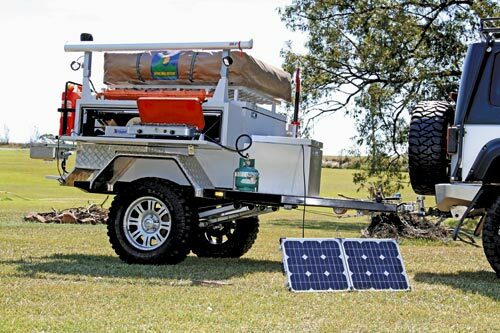 Each trailer comes with a 40W Powertech solar panel, which Leo says will serve the 37L ARB fridge well because of its low power draw. 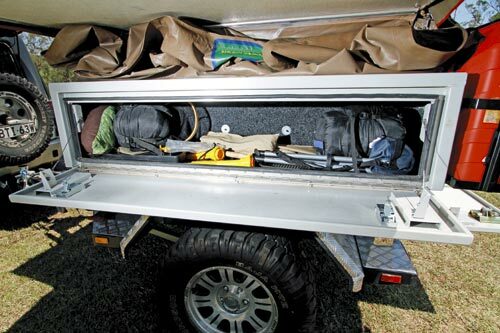 The inside of the main box has ARB tie-downs, LED lighting, the Aqua Cube hot water system and a 12V power outlet. This area can be accessed via the fold-down rear door or from the top when you're set up at camp as the whole rooftop tent tilts. 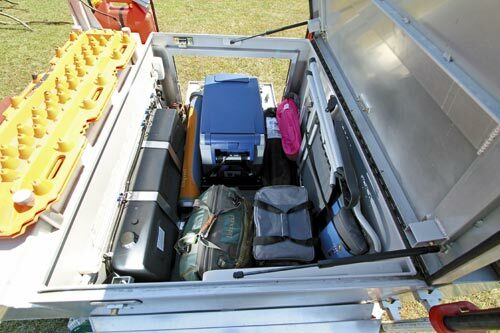 Access from the top is trickier when you're packed up, as it requires a 60kg lift to raise the roof, even with the assistance of two large gas struts. There are two carpeted boxes either side of the main box, each 1480x350x330mm in size (though the recent upgrade increases these to 1600x400x430mm). Our review camper had the kitchen set-up on the nearside. It's not ideal for cups of coffee by the side of the road, but as the rooftop tent opened out to the other side there was no option. The kitchen and the orientation of the tent have been moved to the other side on newer models. The kitchen is basic but reasonably well set up, though our review trailer provided insufficient space for the lid of the pull-out two-burner Primus stove freely open. The later model has a bigger box. 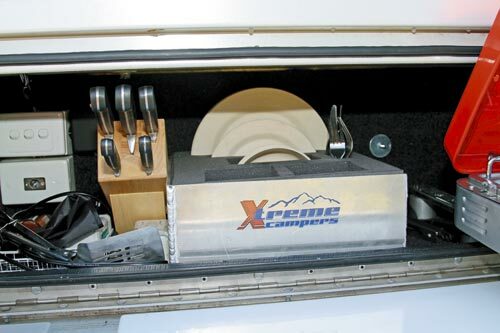 The inside of the fold-down door has a plastic chopping board surface serving both for food preparation and as a table. There's a foam-lined block for the supplied crockery and cutlery set for four and a knife block for food preparation. On the back wall are light switches and four 240V outlets. 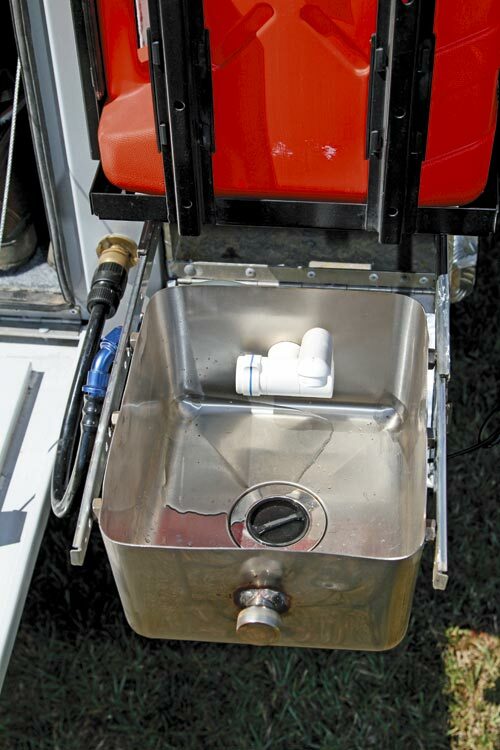 The trailer's rear corner has a pull-out stainless steel sink which in a few seconds connects the tap to power and water from the 75L tank. Our review trailer had several different styles of latches on the various doors, but Xtreme has now settled on T locks all round. The kitchen is shaded by a rollout 1.8m Fiamma F35 awning and the dining area is illuminated by two bright LED spotlights, one long 60-cell LED light strip under the awning roll and another inside the kitchen. For greater protection around the kitchen Xtreme offers an awning with sides all round. 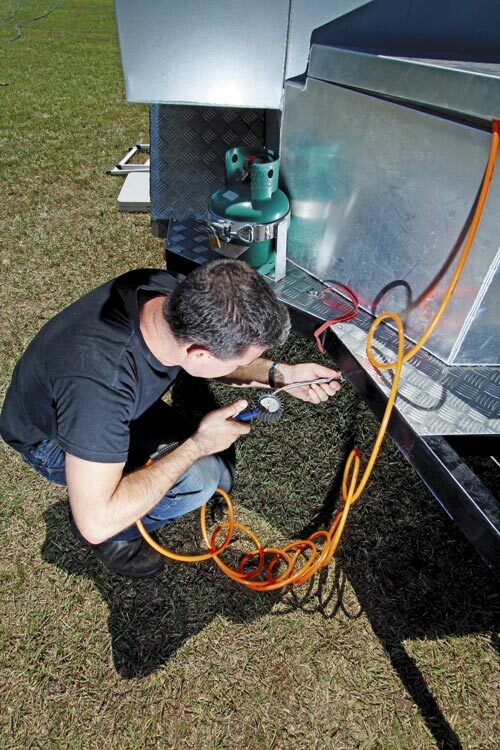 The small single gas cylinder on our review camper has been replaced by a single 4.5kg cylinder. 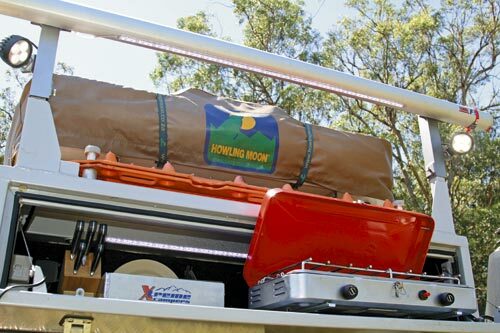 Sleeping is in the tropical-roof-equipped 1.4x2.8m Howling Moon rooftop tent with its 3in foam mattress. 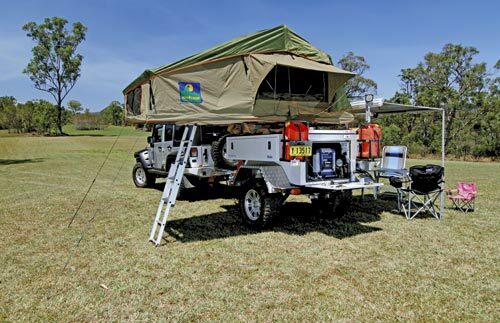 This, as with all rooftop tents, requires ladder access, but is quick and easy to both set up (10 minutes) and pack up. 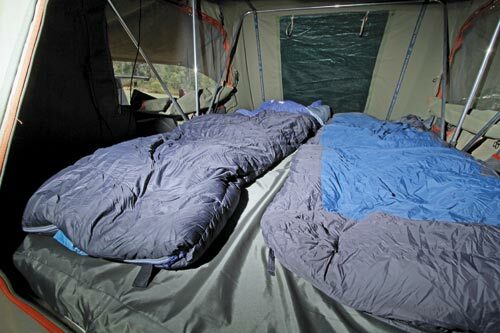 There are optional sides which can drop down under the fold-over floor of the tent to create an extra room for showering or sleeping. 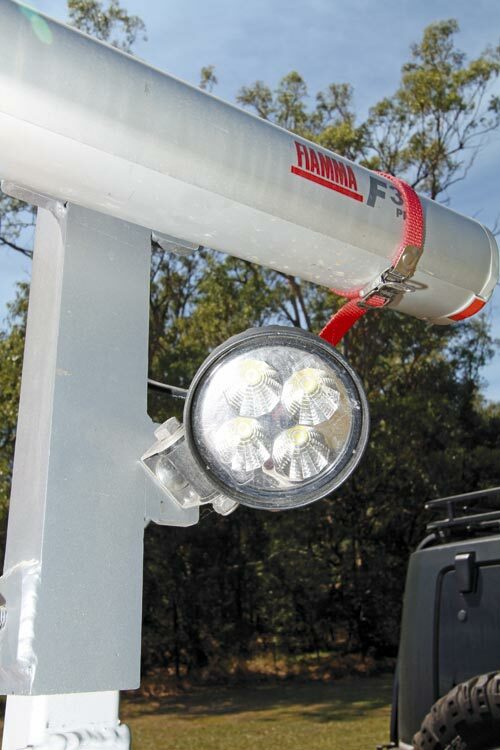 The Flyfisher is locally made and licensed for manufacture by MW Sheet Metal at its Sydney factory, which has an Australia-wide retailer network for service or modifications. 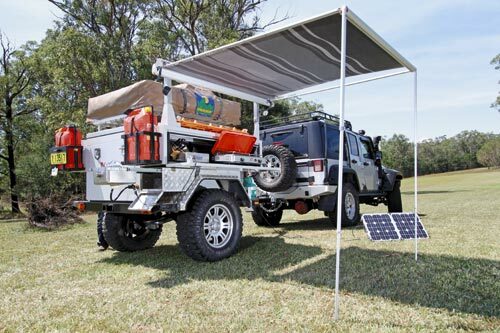 The complete package, as reviewed, comes with a high lift jack, MaxTrax recovery strips, two jerry cans in lockable holders, fold-up table, two chairs, solar panel and fridge, is just $18,990. Kits are also available for the handyman. The Xtreme Flyfisher is a capable offroad vehicle that has much to offer those who want to tackle rough terrain. 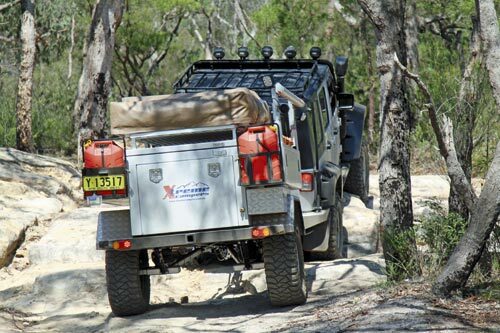 If you're serious about 4WD adventuring then it's worth some consideration. 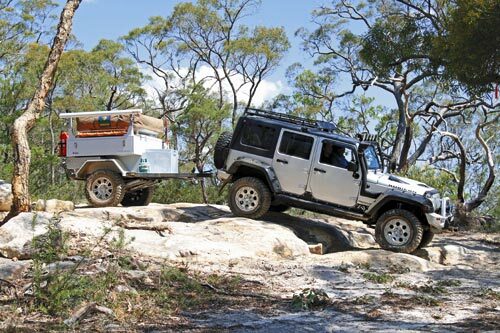 Originally published in Camper Trailer Australia magazine #62, February/March 2013.